I have always wondered what it feels like to be an offspring of a famous family. To me it seemed like all the doors would be open and all your initiatives would be welcomed and highly supported. Would I like to live a life of a celebrity child? If only for one day – yes. Otherwise, I would rather stick to my own life style with all the ups and downs that I have to suffer (just like all human beings). Looking at Georgia May Jagger in this photoshoot, I keep wondering whether it is her actual talent or her famous last name that enabled her to become a prominent English model. 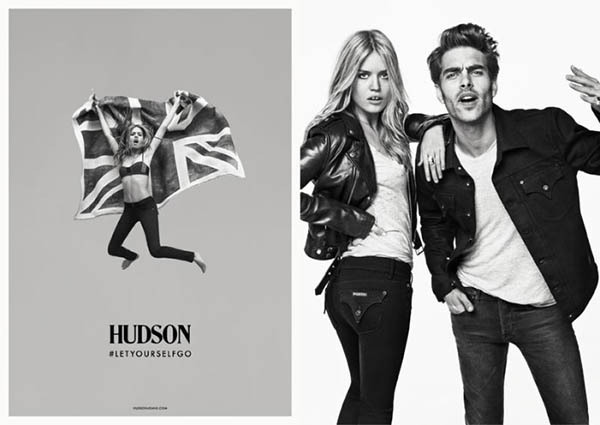 Whatever it was, the girl appears to prove her success with Hudson Jeans Fall 2013 ad campaign. This is not Georgia’s first photoshoot for Hudson – the model also appeared in previous campaigns. Looks like the brand enjoys working with the beauty. Georgia poses alongside the male model Jon Kortajarena for Sebastian Kim. The photoshoot was directed by Patrizio Micelli and the Al Dente agency. I love the black-and-whiteness of the images, which adds an edgy zest to the ads. We wanted to create a campaign that revolved around our brand mantra of “Let yourself go,” and visually set the tone which we could build on, season after season. We chose black and white photography to start because of its minimally beautiful aesthetic and nature. Georgia May Jagger makes the perfect match for the denim brand. She is young, pretty and somewhat rebellious. Plus, the English beauty shared her affection for jeans, which leaves no doubt in her compatibility with the brand. I dress jeans up with a pair of heels, a great sparkly top or a jacket, and some lipstick. For daytime, I like to wear them with trainers or biker boots, a T-shirt and a leather jacket. The campaign features leather pants and jackets, ripped tops, fringed scarves, sheer shirts and a wide-brimmed hat. Check out the gallery to see more images of Georgia May Jagger and her collaboration with Hudson Jeans.